The latest APX600 features a unique under-saddle piezo pickup. The Yamaha proprietary SRT transducer is featured in the highly-acclaimed A Series range. It has a natural tone and the feedback rejection and mix-friendly sound guitarists crave. Although its style has evolved, the essence of the APX remains the same. Today, it boasts a more natural look, a deeper body for better bass response and greater volume, and a new non-scalloped bracing pattern for a responsive, dynamic tone. 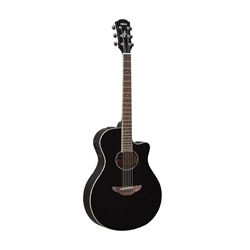 It combines all the attributes that make it one of the world’s best-selling acoustic-electric guitars.